A unique and attractive primula producing lots of striking flowers in June and July. The flowers have red calyces and blue/violet flowers that open from the bottom up. 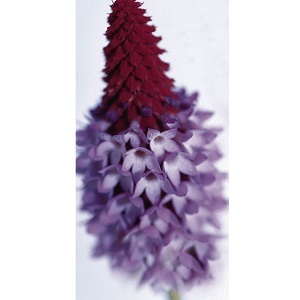 This primula grows to a height of 30 – 40cm, and is good for borders and edging. Primula vialii prefers part-shade and a moist, well drained, humous rich soil. Pack of approx 100 seeds. Sow in early spring to summer. Sowing instructions and a colour photo are printed on the packet. Sow Sow in early spring to summer on the surface of moist seed compost. Press the seeds gently into the compost and cover with clear plastic. Do not exclude light, which is needed for germination. Keep at a constant 18-22°C and germination takes 3-4 weeks. Transplant seedlings into pots when they are big enough to handle and grow on in cooler conditions. Plant out into the garden after the last frost. Grow A rosette of leaves appear later than expected, generally in May. The plants die back after flowering, when they can be tidied up, and start growing again in spring. Mature clumps can be divided in spring.